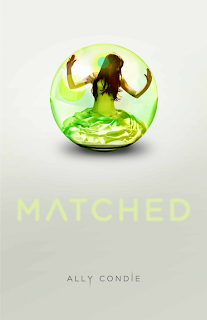 This week's pick is Matched by Allyson Condie, set to be released November 30, 2010 from Dutton. Summary: In the novel, a 17-year-old girl, who has waited her entire life to be told by a group known as “the Society” who her soul mate is, has her world upended when she disc overs she’s in love with someone other than the group’s pick. My Thoughts: A simple premise and something that reflects traditions of real places in the current world, Matched looks like it holds a huge amount of potential to be something engaging and an amazing read, while also making some striking points. It brings up the arranged marriages versus yearned marriages and the power of love. Though this is an element that has appeared in other books, it holds a stronger ground in this one since the entire premise is based on the arranged marriage rather than just an aspect of the book. Not to mention, the cover is very eye catching. Love this pick, everything about it screams awesome - I cant wait for this one too! I think this book definitely has the potential to be good! Love this cover, I can't wait to read it either! I found this book about a week ago and I've been looking forward to it ever since. Everything about it sounds awesome! I am going to be SO disappointed if this book doesn't live up to its cover!